Charatan’s Make London England Free Hand Relief | Old Morris Tobacconist Victoria BC, Fine Cigars, Humidores and Tobacco Merchantile. Charatan's pipes initially found fame in their skillfully carved Meerschaums. It was not until the popularity of Charatan's work forced him to move to a bigger workshop that he began hand-making briar pipes as well. To this day, Charatan pipes maintain their traditional standards of British Craftsmanship. Each Charatan pipe is individually made and finished with meticulous care. 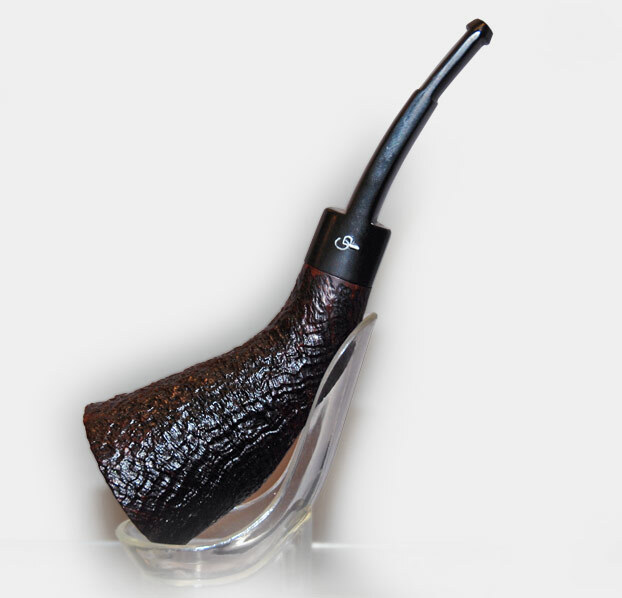 The bowls are skilfully fashioned of ancient briar that has been matured naturally and slowly. This ensures a cool sweet smoke and no breaking-in is required. To those first exploring pipes, a Charatan is a new and splendid experience. To connoisseurs Charatan denotes perfection in pipe smoking. This Charatan executive features a horn shape, with a bowl that cants away from the stem and bit. Smoking horn pipes requires both skill and dedication, but once mastered, they are often the most cherished showpiece pipes in a smoker's collection for their uniqueness and comfort.